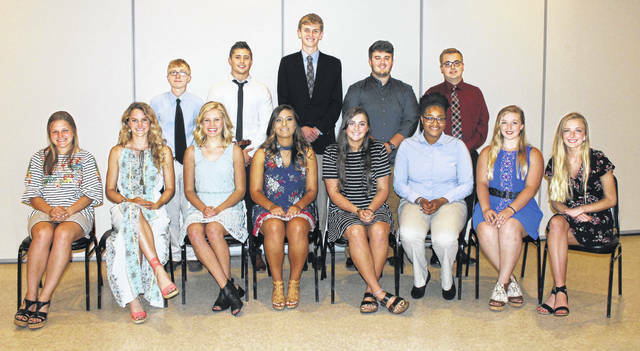 Recipients of the CIAO scholarships included, front from left, Karis Wilson, Gabrielle Goecke, Madison Langhals, Alexa Hawk, Kylie Guagenti, Nikiyja Carter, Faith Gossard and Savannah Meeker; and standing, from left, Ethan Mangette, Joseph Sanchez, Michael Johnston, Nicholas Azzarello and Nicholas Dove. LIMA — The Charitable Italian American Organization of Lima awarded $1,000 scholarships to 12 area students during the organization’s awards banquet on May 16, at the Knights of Columbus Hall. Nicholas Azzarello, Nikiyja Carter, Nicholas Dove, Gabrielle Goecke, Faith Gossard, Alexa Hawk, Michael Johnston, Madison Langhals, Ethan Mangette, Savannah Meeker, Joseph Sanchez and Karis Wilson received scholarships. Kylie Guagenti received the John and Gena Mongelluzzo Scholarship, funded by the Mongelluzzo family, becoming the 13th student to receive a $1,000 scholarship during the event. Students eligible for the scholarship must be graduating seniors from a school in Allen County or residents of the county, hold a minimum grade point average of 3.0 and submit official transcripts, along with ACT or SAT scores. They must also submit two letters of recommendation from school faculty and community members and a written essay; as well as a list of achievements, community service and extracurricular activities. Italian heritage is not a requirement for CIAO’s scholarships or charitable giving.